Fascist scum surround small group of antifascist protestors at Univ. of VA, Charlottesville on 11 Aug 2017. In the aftermath of the monstrous fascist mobilization in Charlottesville, VA this past weekend, we are searching the archives of Marxism for the most important writings on the subject of how to effectively fight the fascist menace. 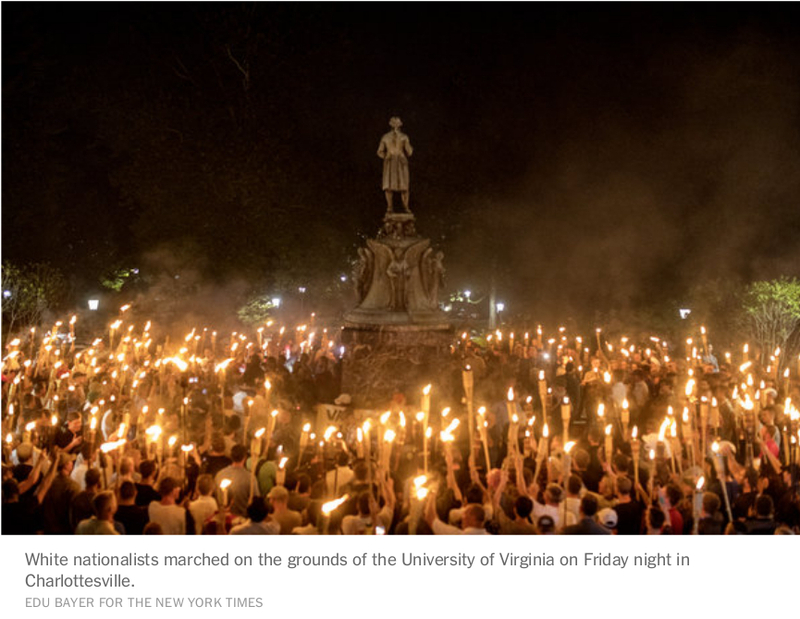 The New York Times reports that the fascists, emboldened by their “victory” in Charlottesville are now planning to run for political offices across the nation, primarily under the banner of the Republican party. We have sought from the inception of our organization to impart to the workers of the US the vital importance of organizing a revolutionary vanguard party of the working class as the indispensable weapon of self-defense of the workers against the capitalist system and against its fascist attack dogs. Without a political party of our own, the working class is left to stand by, impotently begging the paid agents of the capitalist class in both the Republican and Democratic parties to “do the right thing” for the workers. This cowardly posture of “speaking truth to power” effectively eliminates the working class – the vast majority of the population in any capitalist country – to sitting on the political sidelines as the “rightful rulers” of the capitalist class rob us blind and pave the road for a fascist regime in which the workers organizations will be completely destroyed. Under fascism, there will be no future for the trade unions or for any working class revolutionary organization of any kind. Unless we build a revolutionary workers party that has as its ultimate goal the overthrow of the capitalist class and its decrepit, dying capitalist economic system which is the growth medium in which fascism thrives, the working class is doomed to destruction. The experiences of workers in Italy and Germany under their fascist regimes provide ample evidence of this reality. All that being said, we must make clear that the Trump administration, though it has fascists in its top positions is NOT A FASCIST GOVERNMENT! If the Trump government was fascist, we would not be able to write and publish this article, and anti-fascists would not be able to march against the fascist hordes as they did in Charlottesville this past weekend. We would all be in concentration camps – or dead! It is imperative that workers understand the qualitative difference between a conservative, worker-hating capitalist political party and its state and a fascist party and its state. The Trump administration is a neo-fascist bourgeois government, not a FASCIST government. We can see even now the tremendous splits that have taken place within the Trump administration over the events in Charlottesville. Even the hideous Confederacy-apologist Attorney General Jefferson Beauregard Sessions has come out publicly denouncing the fascist mobilization in Charlottesville: this would not happen in a fascist government. But the fascists are inside the Republican party and are preparing to take it over. They are supported financially by the most right-wing elements of the US capitalist class who are tired of having their hands tied by the US Constitution and Bill of Rights when they would like to just go out and smash every union and socialist/communist/anarchist political organization in the land! It is this powerful but still minority fascist fringe of the US capitalist class that is pushing the nation towards fascism. They have a large portion of the ruling class, the cops and courts and military on their side. BUT THEY HAVE NOT TAKEN POWER YET. If we confuse the semi-fascist Trump with the REAL fascist threat we will be directing our defensive attacks at the puppet rather than at the master. We saw who the fascists are this weekend. They are the usual scum: the Klan, the Nazis organized by David Duke and all of that syphilitic gutter scum attached to them like lampreys on a shark. THESE ARE THE FASCISTS WE MUST CONFRONT AND DEFEAT. They are organizing their ignorant hordes of lumpen and petty-bourgeois thugs to rampage across the campuses and cities and towns across the USA this fall. We can and we must organize now to overwhelm them numerically whenever and wherever they appear, and we must ignore the appeals from their allies in the Democratic and Republican parties and among the clergy of all denominations who tell us to “turn the other cheek” against those who seek to kill us! The working class must be organized through the trade unions into massive, highly disciplined battalions trained and led by union members who are military veterans to defend ourselves effectively in a military fashion against the nazi gangs. If we do this – and ONLY if we do this can we send these fascist scum scurrying back to the holes they emerged from! The next time these filth try to organize a torchlight parade they must be crushed by the full weight of the integrated working class! The next time they try to launch a provocation in broad daylight as they did in Charlottesville they must be met with the full weight of the entire integrated working class, led by strong, determined trade union contingents and they must be crushed! They must have their heads acquainted with the pavement and be sent crawling home to lick their wounds. This is the only “debate” the fascists understand! Workers must come to understand the scientific, revolutionary Trotskyist definition of what fascism is and what it isn’t and what must be done to stop it. If we do not understand fully what we are up against, where it comes from and who supports it we are powerless to stop it. So in the interest of furthering your education on the subject of fascism, we offer these insights from the revolutionary leader Leon Trotsky. If you have questions or comments on this material you can post your comments here and we will be happy to respond; otherwise contact us directly at iwpchi@gmx.com. Workers of the World – Unite to Smash Fascism! “The [people of the United States] for a long time thought that Fascism had nothing whatever to do with them. They had a republic in which all questions were dealt with by the sovereign people through the exercise of universal suffrage. But on [August 11th and 12th, 2017], several thousand Fascists […] armed with [shields, clubs and firearms descended on Charlottesville, Virginia]. What does tomorrow hold? Of course in [the United States], as in certain other European countries (England, Belgium, Holland, Switzerland, the Scandinavian countries), there still exist parliaments, elections, democratic liberties, or their remnants. But in all these countries the class struggle is sharpening, just as it did [in the 1920s and 1930s] in Italy and Germany. Whoever consoles himself with the phrase, “[The United States] is not Germany”, is hopeless. In all countries the same historic laws operate, the laws of capitalist decline. If the means of production remain in the hands of a small number of capitalists, there is no way out for society. It is condemned to go from crisis to crisis, from need to misery, from bad to worse. In the various countries the decrepitude and disintegration of capitalism are expressed in diverse forms and at unequal rhythms. But the basic features of the process are the same everywhere. The bourgeoisie is leading its society to complete bankruptcy. It is capable of assuring the people neither bread nor peace. This is precisely why it cannot any longer tolerate the democratic order. It is forced to smash the workers by the use of physical violence. The discontent of the workers and peasants, however, cannot be brought to an end by the police alone. Moreover, it is often impossible to make the army march against the people. It begins by disintegrating and ends with the passage of a large section of the soldiers over to the people’s side. That is why finance capital is obliged to create special armed bands, trained to fight the workers just as certain breeds of dog are trained to hunt game. The historic function of Fascism is to smash the working class, destroy its organizations, and stifle political liberties when the capitalists find themselves unable to govern and dominate with the help of democratic machinery. “The Fascists find their human material mainly in the petty bourgeoisie [small businesspeople]. The [small business owner] has been entirely ruined by big capital. There is no way out for it in the present social order, but it knows of no other. Its dissatisfaction, indignation and despair are diverted by the Fascists away from big capital and against the workers. It may be said that Fascism is the act of placing the petty bourgeoisie at the disposal of its most bitter enemies. In this way big capital ruins the middle classes and then with the help of hired Fascist demagogues incites the despairing petty bourgeois against the worker. The bourgeois régime can be preserved only by such murderous means as these. For how long? Until it is overthrown by proletarian revolution. ” The capitalists arrive at Fascism not at their own whim, but through necessity: they cannot any longer preserve the private ownership of the means of production save by directing an offensive against the workers, save by strengthening the oppression, by sowing misery and despair around them. At the same time, fearing the inevitable resistance on the part of the workers, the capitalists, through the medium of their agents, arouse the petty bourgeoisie against the proletariat and, while accusing the latter of prolonging and aggravating the crisis, they finance Fascist gangs to annihilate the workers. Should the resistance of the workers to the offensive of capital increase on the morrow, should the strikes become more frequent and important, Fascism […] will not evaporate but instead grow with redoubled force. The growth of the strike movement will impel the mobilization of strikebreakers. All the ‘patriotic’ thugs will participate in the movement. Daily attacks against the workers will be put on the order of the day. To close our eyes to this is to walk toward certain defeat. “‘Do you mean to say […] that there must be no resistance?” No. It is necessary to resist. “We are [not] adherents of that school which thinks that the best means of safety lies in silence, retreat and capitulation. ‘Don’t provoke the enemy!’ ‘Do not defend yourselves!’ ‘Don’t arm yourselves!’ ‘Roll over on your backs and play dead!’ Theoreticians from among this school of strategy should be sought not among ourselves but among the editors of [the bourgeois and fake-socialist press]. It is necessary for the workers to resist if they do not wish to be annihilated. But in that case no reformist and pacifist illusion is permissible. The struggle will be ferocious. It is necessary to foresee beforehand the inevitable consequences of resistance and to prepare for them. “By its present offensive the bourgeoisie invests with a new and incommensurably more acute character the relation between the economic conditions and the social situation of capitalism in decay. Just so, the workers must invest their defence with a new character which corresponds to the methods of the class enemy. In defending ourselves against the economic blows of capital, we must know how to defend at the same time our organizations against the mercenary gangs of capital. It is impossible to do this save by means of the workers’ militia. “The armed organization of the proletariat [scientific term for ‘working class’], which at the present moment coincides almost entirely with the defence against Fascism, is a new branch of the class struggle. The first steps here too will be inexperienced and maladroit. We must expect mistakes. It is even impossible to escape completely from provocation. The selection of the cadres will be achieved little by little and this all the more surely, all the more solidly, as the militia is closer to the factories where the workers know one another well. But the initiative must necessarily come from above. The party can and must provide the initial cadres. The trade unions must also take to this same road – and they will inevitably take it. The cadres will become fused and strengthened all the more rapidly as they meet with an increasing sympathy and increasing support within the workers’ organizations, and afterwards within the masses of the toilers.